Arpita Ganesh, the Founder of lingerie retailer Buttercups has used innovative crowd-funding tactics to get her business off ground. Let’s find out how and why! Founder of exclusive intimate wear brand, Buttercups, Arpita Ganesh is a woman on a mission; a mission to bring in a change in people’s mindset about lingerie; people, who still consider discussion of the body’s intimate needs a ‘taboo’and believe that such subjects should be kept ‘under cover’. In the process, she is also building a highly successful company. Arpita Ganesh will be sharing her experiences with raising money and growing her company at the Women’s Web event, Breaking Barriers To Growth: The Money Edition; get your pass now! Prior to the event, we caught up with her on how followed her passion – and why she wants to inspire other women too. What was that spark that instigated you to take on this mission, when even among many educated women, it is considered a hush-hush topic? Arpita Ganesh: I went for a bra fitting in NY and it changed my life. Just the right fitting bra helped me feel confident, stand tall and be able to wear clothes I had not dreamt of wearing till then. I was amazed at the transformation I had and wanted to bring this simple change to women back in India. That’s how Buttercups began. With most investors being male and not your target audience, raising funding to follow your passion must have been like moving the mountain. How did you do that? What kept you going and motivated? Arpita Ganesh: Clearly there was a gap. Women are uncomfortable with the choices of bras they get and the experience of buying bras. Well, a gynaecologist is respected though she deals with female private parts, but she speaks about her work as a clinical thing. That’s exactly how I think of bras and intimate wear. Yes, it was very tough to convince male investors about how much women wanted better bras. What changed this was when my crowd funding campaign got me 200 women giving Rs. 1,500 each, just on a promise of my bringing them better bras without a site, sample or outlet. The investors were amazed at this metric. That’s what finally convinced a few. How do you compete with well-funded sites in this space? What is you competitive edge over them? Our proposition is bras made with care to provide supreme fit. We have not only a range of 44 sizes, but also variety in all sizes. The market is large enough for ten more players to come in and for all of us to co-exist. I think we cater to a very niche audience and plan to build the business from this niche. Please share with us some of the ‘highs’ you have experienced in your career. What would you count as some of your most significant achievements? Arpita Ganesh: Most significant was to see my lingerie wardrobe full of Buttercups. To have a dream in your mind and then see it come to life, is a high that is unbelievable! My first investors proposal to fund me, over a casual lunch. I don’t think I’ll ever forget that moment, when after 6 years of trying, someone finally believed and wanted to back me. You chose the crowd sourcing model to raise funds for your start-up. How was your experience with it? Arpita Ganesh: Like I mentioned, it was probably the best thing I could have ever done. But, crowd funding needs to be managed well. It’s still a new concept in India and a lot needs to be learnt before anyone ventures to raise funds through it. It’s like a full time project that takes at least 2 months to put together, before you actually start a crowd funding project. 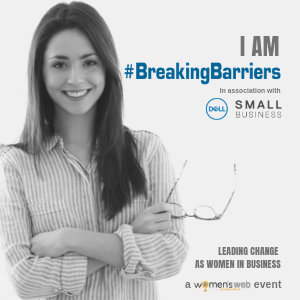 We are delighted that our community will be hearing from you at the upcoming #BreakingBarriers event for women entrepreneurs. In what ways do you feel such networks can help women? Arpita Ganesh: Nothing has come easy to me. I have struggled both professionally and personally to reach here. If I can save even a few women from going through even one or two of my bad experiences and cut short their journey to success by even a few hours, I would very much like to do that. Lastly, we would like to know more about Arpita beyond work. Arpita Ganesh: Ha! She’s a crazy, wild, happy person. She loves dogs, brewed beer and music. Lives life to the fullest. Works hard, parties harder. Found every morning at 9am in office and most evenings at water holes in Indiranagar. If you are an entrepreneur in Bangalore, or an entrepreneur in the wings, come to #BreakingBarriers: The Money Edition and find inspiration to grow faster, and learn the right money strategies to help you grow!